Andrew Mugambi specializes in corporate and commercial law work including mergers and acquisitions, joint ventures and private equity, banking and project finance, energy, oil and gas and infrastructure and aviation law. 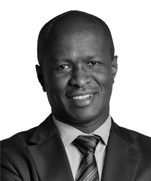 He is one of Kenya’s well-respected commercial lawyers. He has advised on a number of local and multi-national transactions including project financing, joint ventures, privatizations and Public Private Partnerships Projects. Andrew is recognized as a leading lawyer by IFLR 1000, Legal 500, and Chambers Global (all internationally recognized legal directories).